Atelier Mer : information globale sur la mer, sa biodiversité et les menaces qui pèsent sur elle. THALASSA proposes a series of awareness programs for regular and occasional users of the sea, to inform them and make them actors in the fight against the degradation of the marine environment. 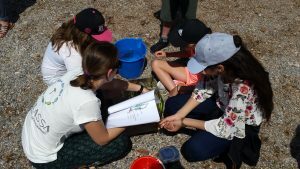 Customized scientific workshops can be offered to schools, the general public and environmental stakeholders such as environmental associations or managers of marine protected areas (MPAs).